This weekend, Atlanta was packed with a host of literary events. For avid readers, the Emmy Award-Winning Poet Hank Stewart’s 10th Annual White Linen Affair held Friday, July 29 –Sunday, July 31 at the Sheraton Atlanta Hotel was most certainly the place to be. The 3-day event was packed with poets, authors and celebrities. Atlanta Reads had the pleasure of meeting many of the wonderful best-selling and new authors that graced the floor during the White Linen Literary Cafe' event on Saturday. 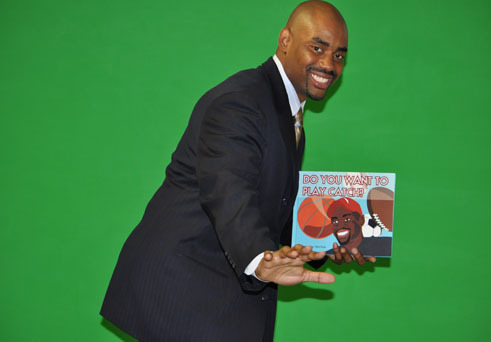 Chris Draft, former NFL player was one of them. April 2010, Brio Press released, Do You Want to Play Catch, by Chris Draft. This 32-page hardcover book is beautifully illustrated by Anthony Sciavi. It is available on Amazon.com and is perfect for children ages 4-8. Draft is also the founder of the The Chris Draft Foundation, which he established in 2006. According to the website, "The Foundation focuses on seven primary initiatives with overarching themes that stress the importance of education, healthy lifestyles, character development, personal responsibility, self-discipline and physical fitness. The Foundation seeks partnerships with local and national community health organizations, school districts and non-profits across the country, striving to empower and uplift communities by educating and equipping families to make healthier choices. While the Foundation’s home office is located in Atlanta, GA, the Foundation is active all across the United States, working in communities across the country from Washington D.C. to Los Angeles, CA, and from Minnesota to Texas. The Foundation maintains a strong community presence in Chris Draft’s former NFL homes: Chicago, San Francisco, Atlanta, Charlotte, St. Louis and Buffalo, his birthplace of Kansas as well as his hometown of Anaheim, in Southern California. Chris Draft and the Chris Draft Family Foundation travel across the United States during the NFL season, recruiting for the Foundation’s Asthma Team™ and Character Team™. Throughout the year, additional events with youth and families are planned around all Foundation initiatives, including visits to military bases and hospitals, the Get Checked and Get Fit™ Draft Day® fitness camp for youth and families (traditionally held at the Super Bowl in February and in the current NFL home city in the off-season), film screenings, roundtable discussions, school visits, park clean-ups and gardening projects. 2010 marks Chris Draft’s 13th year in the NFL, and his experience has shaped the Foundation’s mission, goals and community work. As an active NFL player living with asthma, Chris works with national and local organizations to increase awareness of the disease with a range of PSAs and special-themed events using his personal experiences to inspire others. A health and fitness advocate, Chris designed his Draft Day® fitness camp that debuted in 2006 at the NFL YET/Atlanta aimed toward providing youth and parents with tools to make choices to live healthier lifestyles. The importance of family literacy and character education, with a focus on personal responsibility and self-discipline fuel the Foundation’s major initiatives, all centered on uplifting communities and empowering families to live healthy lifestyles."